I am still sans camera today. I hope to amend that situation soon. I have to admit, I have become utterly spoiled by digital photography. While I am still deeply fond of our venerable, manual Canon film camera, which is older than a great many of my readers, I never carried it with me nearly all the time like I do nowadays with the digital. The camera turns out to be hopelessly mutilated, but at least my photocard was unharmed. So while I don't have any brand-new photos for you, I can salvage photos up to Mardi Gras Day. Speaking of which, thank you all for your concern about the Mardi Gras shooting incident. I'm fine. My co-worker is fine. There is still no word on the child in the crowd, but that's good news. It was diagnosed as a "graze wound" in the field, and if the child had had serious complications or died it would have made the news, and I have seen nothing more about it, so that is good news. In the comments section for my last post, Teresa wondered why the New Orleans I describe here is so different than the New Orleans we are all seeing (or not seeing) on the national news in America. I don't know if I have a straighforward answer for that, Teresa, outside of the fact that news reporters would rather cover stories about what is happening than to cover stories about what is not happening. As a result, you see some coverage about people in the the un-flooded parts of town repairing wind-damaged homes and re-opening businesses. You hear about funds coming in. You hear about Members of Congress finally getting their Federal fannies down here 6 months later to have a gander at the worst-hit sections of the city. But you don't see the vast chunks of the city still just sitting there, echoing and empty, rattling in the stiff March wind. By the way, I'd like to mention to Wendy in England that we New Orleanians were deeply touched by the fact that Prince Charles and his wife not only visited New Orleans but actually got out in the middle of some of the worst-hit parts of towm, interacted with people directly, hugged folks and got their shoes dirty, which is more than most of our American Senators and Members of Congress have done. It was a deeply dignified and kind thing to do. Some people are handling this whole Katrina thing with a staunch sense of humor. 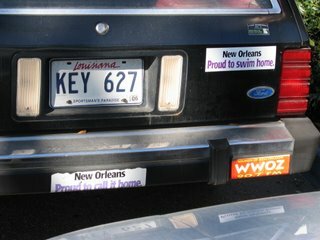 In the lower left on this vehicle's rump, you will see a standard local bumpersticker: "New Orleans: Proud to call it home." In the upper right quadrant, a new one: "New Oreans: Proud to swim home." The obsessively clean, waxed and shiny car reflecting all this infomation, down there at the bottom of the picture? That is so definitely not my car. Here are a few random pre-Mardi Gras photos from the photo card extracted from my camera. This is a shawl-in-progress lounging on my steering wheel while I wait for a drawbridge. The shawl wanted to have a look at the Ninth Ward. 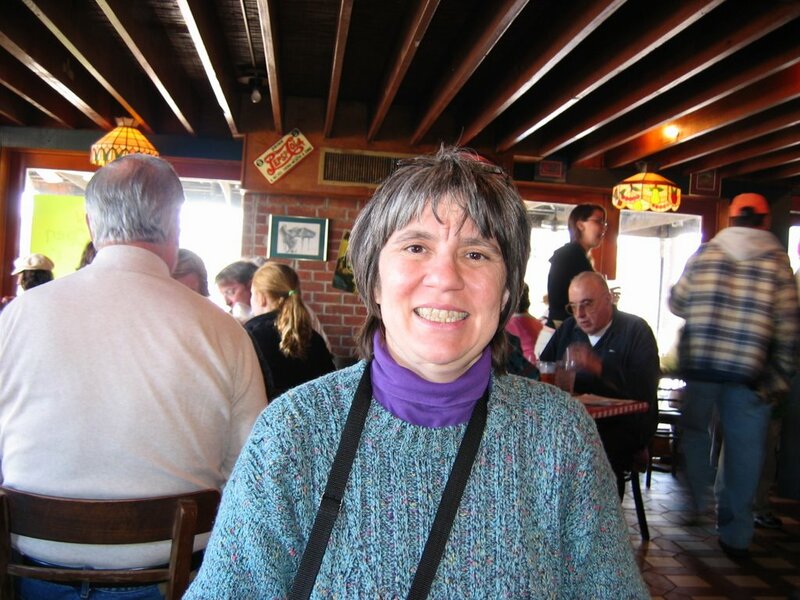 And here I am having lunch with my sis-in-law Mary, a fairly new knitter. Mary is not in the picture because she was taking it. This is my "grin and bear it" face; mostly because at the time this picture was taken, I was trying to grin. I'm really not baring my teeth. I'm saying "take the picture!" through clenched teeth. And no, I did not knit the sweater in the picture, it is an elderly commercially knit garment which has become a "work sweater" because I can get it all doggy and just throw it in the washing machine. Since I am bi-locating for work, I am also planning to bi-locate for knitting. As soon as Mom's house has electricity, I plan to bring knitting supplies there. Since Dad died less than three weeks before Katrina, the artsy side of me wants to cheer the house for Mom. I know she (nor I ) will ever forget that Dad died in the rear bedroom, but I think some bright new colors along with the mandatory hurricane repairs will help, especially if I can encourage her to move into the front bedroom. This will give me some quality time with Mom, and a chance to brighten up the back bedroom and turn it into a proper guest room. The back room has a painted pine floor that really wants to be white, like a beach house, and the plaster walls are begging for a bright, non-neutral color. The other day we got sort of carried away at Home Depot and bought a bunch of new light fixtures which the electrician will install by Monday, then all we have to do is wait about seventeen months for the city inspector to come by and say its safe to turn on the lights. I also plan to make the back bedroom the place where the guest bed and my knitting machine live. I don't do much with the knitting machine at my own home, so this will be the perfect spot for it. Once the house is repaired, it will give me something different to do on the weeknights I spend in New Orleans, and I can use it to make a few interesting throw pillows for Mom, and to stash-bust a zillion odds and ends into cage cozies for the animal shelter. Now this is the point where I know I need serious help. I am seriously contemplating establishing a stash-busting endeavor at my mother's house involving a knitting machine and a substantial amount of yarn oddments. I think this is a good idea because there is only one helpful feline to contend with at Mom's house, and he has to sleep sometime. Because our own household deities are even more fascinated with the knitting machine than they are with hand-knitting, continuous volunteer feline assistance makes it quite difficult to use the knitting machine at my own home. And on those rare occasions when I manage to evict them all from the room where the knitting machine is deployed, I find myself facing a continuous, piteous and highly distracting chorus of meowing and scratching at the door. I am seriously contemplating a UFO stash at Mom's house, the idea being that if I have nothing but stash-buster cage cozies or UFOs to knit, that lots of animals will be warm next winter and UFOs will finish themselves. In short, am seriously contemplating infecting not one, but two homes with my stash. Your votes will be taken with utmost seriousness. Dez, I say home is where you have your stash. If circumstances are causing you to have two places to call home, then by all means divvy it up and keep yourself comfy. Know, however, that whatever you *need* will be located at the *other* home when you want it.....sez she who brought everything with her except the directions for the grunt and finish project this weekend. 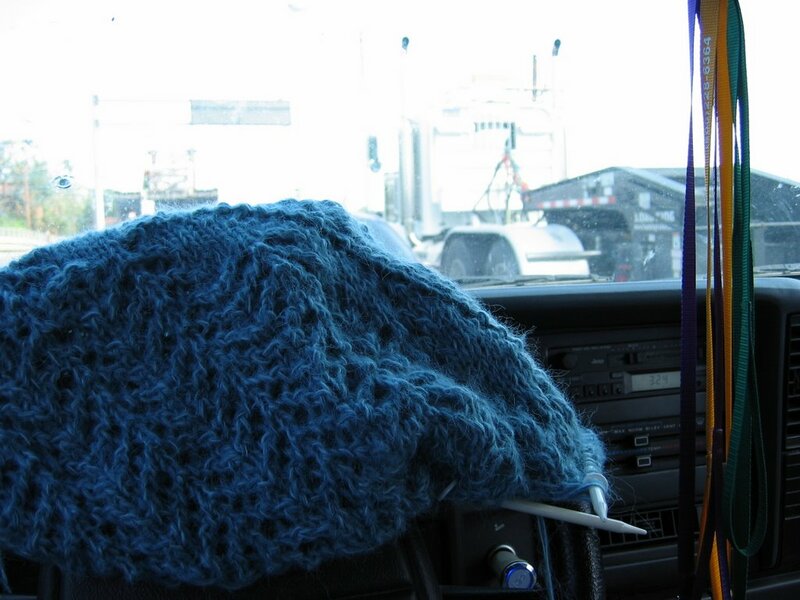 You are a perfectly sane knitter who needs chocolate and beer in maintenance proportions. 'Nuff said! You are perfectly sane AND brilliant! You are a perfectly sane knitter who needs therapy (knitting) and medication (beer and chocolate) in high enough quantities to disable any logical thinking that might cause you to think otherwise! You need chocolate and beer. There is no problem. Go for it! Sounds like a perfect plan to me. - you are perfectly sane for a knitter and as evidence I offer the fact you are providing your own therapy with your stash. Hope someone will provide the chocolate and beer medication. I vote for therapy and medication. I'm from the "northshore" but I've spent A LOT of time recently in Metairie. My husband and I are working on his apartments, trying to get them ready for habitation. I'm convinced anyone who was touched by the hand of Katrina deserves all the therapy and medication they can get. OTOH, I'm so thrilled to have stumbled across a local knitter (I literally don't know anyone who knits, except for the ladies at the LYS in BR), who blogs (praise be) and even owns a knitting machine! I've been waiting for you to update your blog ever since I read your wonderfully funny comment in another blog regarding FEMA trailers and vowels in Finnish. (umm, I think that was it, it's been a while--anyway, it was funny!) Do you know of any other blogging knitters in this area? I'd say your perfectly sane, but serious applications of chocolate and beer (preferably not at the same time) can't hurt. The feline deities in my house don't get to help with a knitting machine, as I have inconsiderately refused to supply them with one, but the youngest adores the umbrella swift and the blocking board and insists on inspecting everything I do with them. He's a very helpful kitty. You're asking US about stash overload? Sheesh. It's like asking Willy Wonka if you have too much chocolate. I actually was drooling over the thought of another place to store stash. My only consolation with my stash is it is much easier to store than Paul's bowling balls. I say administer a little chocolate and call it good. Then, of course, I think chocolate helps just about anything. you need chocolater and, i agree with the other commenter - either bourbon or brandy, save the beer for the chips. two homes - two stashes, no problem there! just buy two of everything like all those little accessories and make two copies of your current patterns... you will leave something at one or the other... on the other hand, if you stick to machine knitting only in NO and the rest at BR.... but we know how long that will last! best of luck with the renos... it sounds like your mom's house is trying to return to normality - hope entergy comes thru soon! Since you have two homes, you are perfectly sane, but chocolate is always necessary! My deity doesn't bother my knitting (lest she be deprived of a LAP!) but can't resist tissue paper patterns, which is why my SEWING machine resides at my mom's.